To Be Takei weaves an intuitive thread as it chronicles Takei’s life in mostly chronological order. The film finds a pivotal starting point in the internment of Japanese-Americans following the attack on Pearl Harbour, and To Be Takei recounts in detail Takei’s memory of being taken to the camps with his family. The uncivilized discrimination of his family and the obvious violation of their civil rights are paralleled with Takei’s own interpretation of the commendable “Americanness” his parents showed in refusing to sell out their dignity when asked to swear their allegiance to America and forswear their allegiance to Japan. The film takes the scars of the internment camp as character motivation for Takei’s story. To Be Takei features some cringe-worthy excerpts of Takei in politically incorrect bit parts that were offered (and accepted) as roles that would boost his career, and the actor admits in the interviews that he wholly regrets taking such belittling parts for exposure. His account of growing up and developing his skills as an actor, while becoming equally conscious of his sexual orientation, reveals a talent for bridging gaps in civil rights through performance. Takei, however, reflects proudly upon Star Trek’s mission “To boldly go where no man has gone before.” The reflections upon playing a role in the multi-ethnic cast of Star Trek reveals the racial politics of the time, for interviews and excerpts alike note how Sulu makes significant progress for Asian-Americans on television, yet he frequently defers to the reigning white boy of the enterprise, Captain Kirk. At the same time, Takei’s accounts of being a closeted gay actor show the issues with which culture was willing to engage and which ones it was not. Trekkies will certainly enjoy the roster of Takei’s former co-stars who appear in the film. 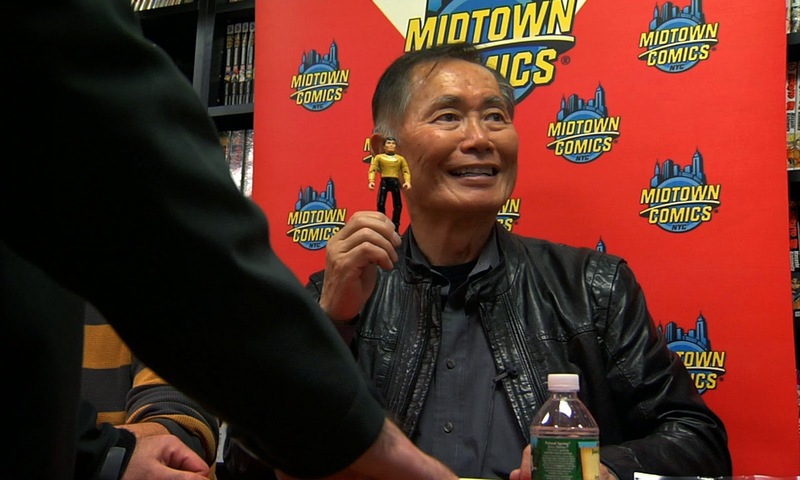 Virtually all of the key surviving Star Trek cast mates appear and illuminate various aspects of Takei’s personal and public life. The interview thread with William Shatner is notably bizarre, for few—if any—of his answers jive with the chorus of voices chatting throughout the film. (He barely admits to knowing Takei at all.) Shatner’s aloof and evasive answers afford some implication to the alleged rocky relationship between he and Takei, and the film offsets the tension with some amusing excerpts of Takei’s roast of Shatner during a TV special. Whether it is the truth, an act, or something in between is open to the viewer. To Be Takei notes steps of social progress as it charts Takei’s career and his long-time relationship with his husband, Brad. Ample footage shows the Takeis having a strong and normal relationship as they bicker playfully like any old couple. They’re a charming pair of opposites, as Brad is a bit high strung and acts as a foil in a comedy routine with George’s droll comedic timing. The film parallels Takei’s advocacy for equal rights for GLBT Americans with the experience he and other Japanese-Americans faced in the internment camps. The juxtaposition notes that change is a slow process, but not impossible. Similarly, To Be Takei follows Takei’s production of a musical production that pays homage to the legacy of the internment camps. It’s a surprising piece, both for the frankness and intimacy Takei gives to the production, and for its ability to convey the various aspects of Takei’s persona noted in the film. Takei’s star persona is front and centre throughout the film, and To Be Takei is just as much about the aura of celebrity as it is about the divides between race, gender, and orientation in America. The film is great fun as Kroot and Weber alternate between Takei’s hilarious appearances and his equally droll stories. His personal anecdotes and the trips to the past extend the story of his celebrity into a greater American legacy, for his role in bridging divides both onscreen and off ultimately conveys an admirable use of celebrity for the greater good. To Be Takei is far better than 'ok'.